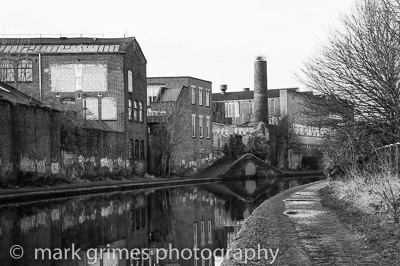 This entry was posted in Canals, Industrial architecture by admin. Bookmark the permalink. Considering that most industrial landscapes are not designed to be particularly picturesque and exist in a purely functional context, it is perhaps not surprising that they are overlooked as an art form. It takes a virtuoso of the calibre of Mr Grimes to reveal the dormant aesthetica of such environments, as is clearly evidenced in this magnificent visual sculpture. We, the viewers, are granted entry into this alternative world, transformed into something magical by the mechanical lens and the photographer’s skill, but perhaps most crucially, by the transformative power of an awesome imagination. On a personal level, I would say that the one overwhelming feature of this photographer’s undeniable talent is how he is able to impose meaning, whilst allowing the viewer to feel that he has discovered his own visual tapestry. Time and time again the consensus of interpretation is repeated, such that there is almost a collective consciousness among the audience. It’s as though each viewer experiences the illusory state of having his/her own critical perception of each image, whilst all the time being irresistibly drawn into a prescribed vision. I have a friendly warning to all the Grimes’ fans out there: you may very well believe that you are following your own critical trajectory when you evaluate these pictures, but your judgements will almost inevitably be confined to the artist’s event horizon. Dont fight it, enjoy the ride! Had a bit of a laugh the other day, and you’ll be pleased to know your site played centre stage in the anecdote. I told a friend of mine, Mark Sceptic, about your site. I had told him rather earnestly that he ought to have a look at your site, that’s if he could take time out of his busy schedule as a radio broadcaster, public speaker, magazine columnist, and business marketing specialist consultant solutionist. About 7pm I received a smiley text message and a smiley emoticon: “Very funny” the message read, “flash photography indeed!” I had told him to visit the website, but I had added the warning that it contained some flash photography! Well, needless to say, the moment he logged in he saw what I had been referring to. A double entendre indeed! I insert this anecdote here as he was particularly taken with Canal Lifeblood, as it reminded him of his school days, as he used to walk along this very route on the way home from school everyday. I couldn’t shut him up about the aspect of reflectivity on the surface of the water. He told me ,via a text message, that a most interesting effect can be achieved by turning the image upside down. The results were very interesting. Perhaps you’ll agree. There’s certainly a lot going on in this image. Keep up the splendid work.